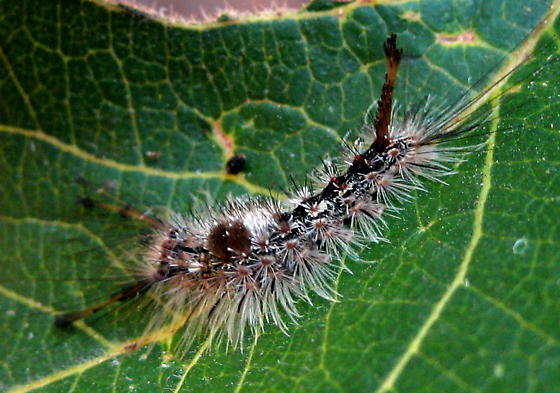 Posted on September 28, 2011, in Acronicta, Acronictinae, Invertebrates, Lepidoptera, Noctuidae. Bookmark the permalink. 9 Comments. I took a photo of an Acronicta dactylina the other day. Is it a mimic, too? There wasn’t much said about it in my guide book. 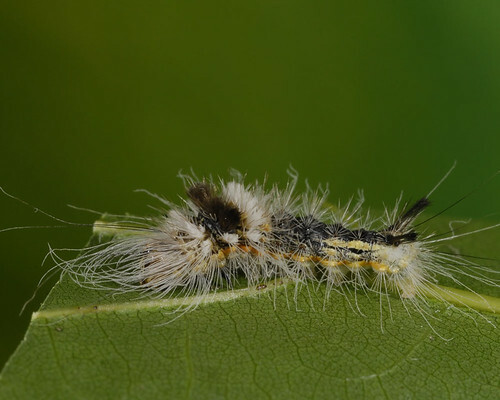 I haven’t raised that species yet, but it appears to resemble an arctiid. A lot of what is called mimicry within the Acronicta is just conjecture based on their appearances, the ecology and chemistry hasn’t been worked out yet. I’m about to post an update – I still have a rash from A. impleta! Very interesting. If I recall correctly, the toxins are in hollow hairs of some urticating caterpillars and are delivered when the tips of the hairs break off. Did you use the same caterpillar on yourself for the other tests? If so, then possibly the venom was depleted. Acronicta oblinita caterpillars are pretty common here in the late summer, brightly coloured and in exposed positions – as if they don’t worry about birds. I guess I will be careful if I get the urge to pick one up. I raised many oblinita this summer and did not get any reaction, but I mostly held them in my hands and did not purposefully rub them on the sensitive skin of the back of my hands or arms. Next year I will try! 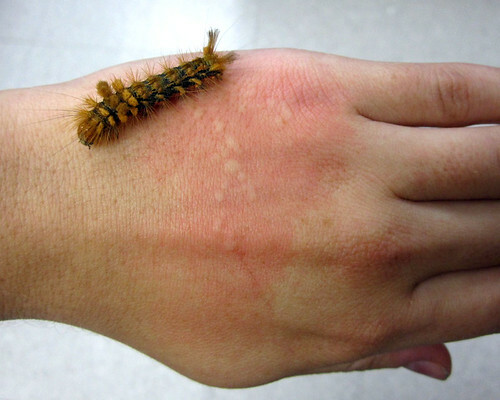 I am allergic to insect venom – your little bug there would cause exactly the same reaction with my hand. I just revmoed 15 of these little %#*&@ blankety blankety suckers from my three heirloom plants! FIFTEEN! They eat the leaf life similar to the way you eat corn off the cob. Very fast…celan…and very gone! FYI: The post about not eating fruit may not be accurate. I took all 15 of these guys placed them on garbage can lid in the sun for the birds to find. I also placed four damaged green tomatoes in the lid. Have gone back periodically to check their demise…and several are consuming the already gnawed on tomatoes. So…they WILl eat the fruit! I assume the odd damage on my tomatoes is indeed from them!The hardest trick is seeing them on your vines. They are sloth like. Don’t move fast…and are the same color are your plant. You have to get real still, and stay focused on what your eyes are seeing. And then VIOLA! Your efforts will be rewarded when you see one! Usually hanging underneath the leaf or limb protected from the sun rays.Here is my experience. The leaves are missing. The stalk, trunk or limb is all that remains…there are black poop droppings on some leaves…these are all the signs of the ellusive HornWorm. If you see any of these…get out your patience and hunt them down!Hope that helps any future readers!